Applying to College welcomes a guest post from Yue Ren, a freshman at Harvard College. Yue currently works at Argopoint LLC, a Boston-based management consulting firm. I have found Sharon’s advice on Applying to College to be insightful in helping prospective college students write great essays. Not only have I found her advice integral to writing great college application essays, but also applications in general for jobs, internships, and more. First, I would like to provide my thoughts on college essays to highlight the importance of these elements in the real world. Express Yourself with a Story: In my experience, the best way to communicate an idea is to tell a quick, concise anecdote. Think about all those lessons you have learned in your extracurricular activities or throughout your life. What do these stories tell about your talents, aspirations, or character? I also believe the manner in which you tell a story, including your tone, mood, and attitude, reflects on how you react to certain challenges or successes. This provides just as much information to the reader about your character as the actual story you write. Therefore, word choice in your expression is crucial. Be Human: Why is talking to your friend so much more fun than reading an old biography? Construct your stories with feelings and emotions such that the reader can experience the breadth and depth of your happiness, anger, pain, or excitement. If you are ever wondering why your friend refuses to give any hints about his or her essay, it might be because it is personal; it might reflect intense emotions. A journey in a day in the life of you is filled with crescendos and decrescendos that may ultimately shape your outlooks. Do not be afraid to share them with admissions. Write Truthfully: Honestly, lying is hard. No matter how much detail you slap on a lie, there are crucial, significant elements that are still missing. Not only do these missing elements signal a lie, but also they are the parts of the story that provide genuineness and insight into your life. Save yourself the trouble of trying to write about stuff that you have never done, and just pour your heart and mind into those events you have faced. If you participated in a thousand extracurricular activities in high school, now is a perfect chance to talk about a few of those thousand topics. Seek Peer Critique: Although many people choose to not let anyone see their essay, I found that letting your teachers and maybe a close friend see your essay brings new perspective. In the first example, there is a sense of camaraderie and hints to a sense of mutual benefit from engaging with students all over the world. However, to my teacher, it also sounded rather suspicious and implied that students were in it together to defend against something. In addition, admission officers are only taking so much time to read your essays. Make your expression clear. The edit uses more sophisticated, mature language, which demonstrates a fluency with words. The advantage of the edit is the clear message that learning together with diverse students derived mutual benefit. You cannot control what your reader thinks or how your reader interprets your essay; you can control how you express your ideas. Therefore, express them wisely and always be conscious of your audience. To keep the college essay in context, it is just one part of your application, but I would recommend treating it as the part of the application that truly identifies you. It is an opportunity, not another barrier keeping you from clicking that submit button. Sharon’s blog is truly awesome. I would check some of the posts like “Stuck? 5 Tips to Jump-Start Your College Essay,” “How to Succeed with the Common App Essay Word Limit” series, for advice on college essays. I know I found them abundantly helpful when I was writing my essays. But her advice extends beyond just the scope of college essays. I would like to stress that for courses, jobs, or internships, I found these tips equally as applicable and useful as they are for college essays. Because I gave a quick example of an activity I led, I clearly communicated to the listener that: This kid wants to learn and can be honest on areas where he needs improvement. He clearly faced a respectable challenge and emerged successful. Even though that may not align perfectly with the work done at the organization, this is the attitude required to succeed. Finally, this freshman seems ready to contribute. Going through the college applications process, you will discover that the tips garnered from the Applying to College blog and lessons learned from writing great college essays will be crucial in scoring opportunities in your future. Categories: College Essay - Writing, Writing to Apply for Jobs | Tags: be honest writing your college application essay, college application essay tell a story, college essay writing seek critiques, college essay writing word choice, Harvard, writing college application essays, writing for job and internship applications, Yue Ren | Permalink. Some words shouldn’t find their way into college application essays. I’m not talking about words that make you sound like a thesaurus (I’ll get to that at a later date) – I’m talking about words that are weak. Weak words are like limp handshakes – a little damp, a little icky – you wish the person shaking your hand had the confidence to do it right. Maybe nobody told them. Which is why I’m telling you. What Makes These Words Weak? They’re all vague. (What “things” are you talking about, anyway?) They’re also BORING. Please, don’t bore your college reader (zzzzzzzz). How Do You Get Rid of Weak Words? Easy. Learn to recognize them, and then substitute stronger, more interesting words. Interesting words are often more specific words. Find the weak words in your essays and substitute stronger ones. You’ll show off your writing skills, and impress your college reader. 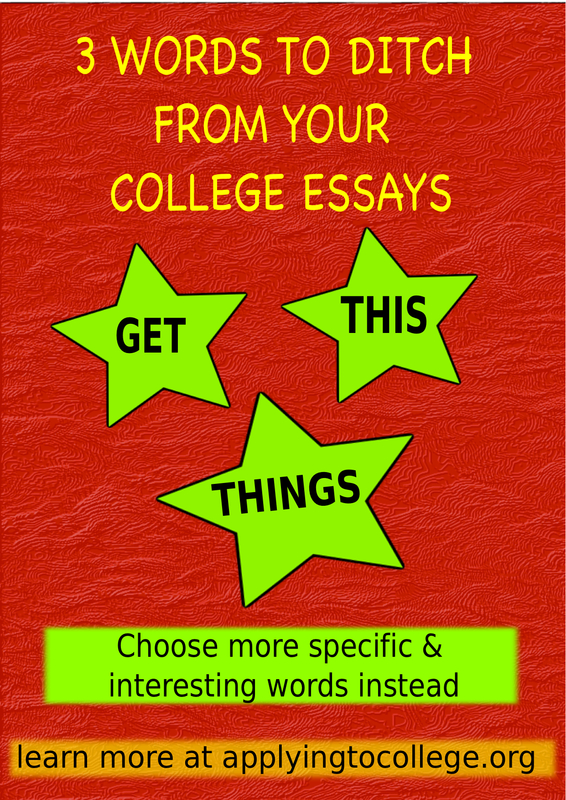 Categories: College Essay - Writing | Tags: 3 words to ditch from your college application essay, college essay writing tips, first impressions college consulting, sharon epstein, writing college application essays | Permalink. 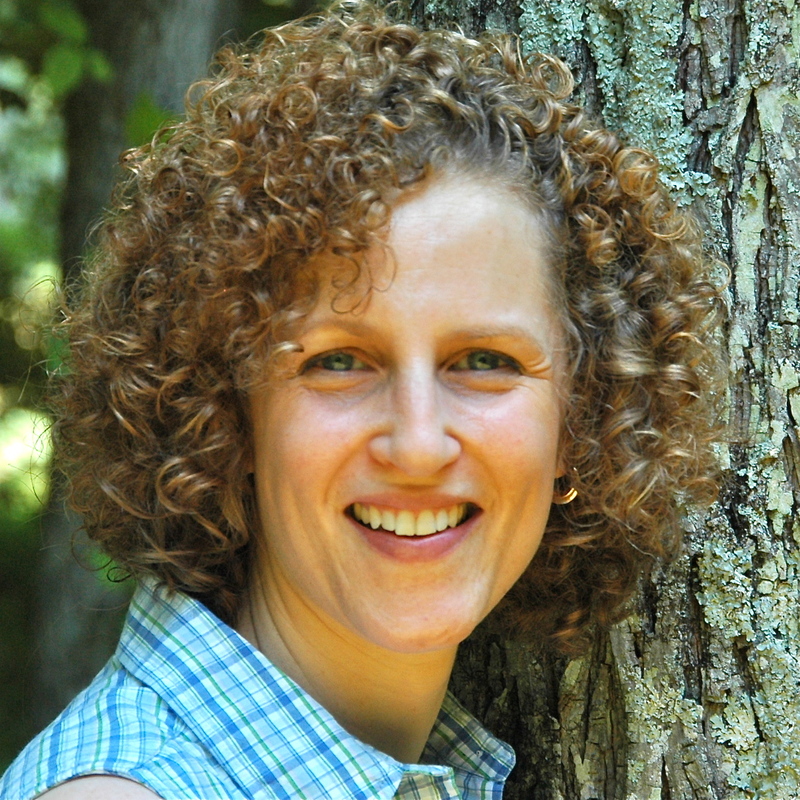 Today’s post is a guest blog from my good friend and colleague, Debra Wilburn. For more than two decades, Debra has facilitated student development through career advising, first at Antioch College and now as Assistant Director of Career Services at Wright State University, in Dayton, Ohio. When I asked Debra what she’d like to write about, she knew immediately: the importance of revising your essays. I work with top-achieving students on essays for a competitive internship program. Along with a résumé, the student’s essay is circulated to hiring managers for review. This package is the first impression the students make: it either opens the door to the next step (an interview), or leads the manager to believe the student is not the right fit. When that first door opens and they make good professional contacts, the students find other doors opening, and step by step they build interesting, rewarding careers. It all starts with their essay. And yet – they often complain about the work of writing it. Specifically, they complain about my requirement for revising the essay. I don’t think I need to revise it. I get As on all my papers. Professors have never complained about my writing before. Me is not the audience for the essay! I thought I was a good writer, but now I know there’s always room for improvement. I wish someone had challenged me like this before. These top-achieving students do not bring me solid and winning essays on the first go-round. They get there by doing the work of revising. An experienced reader can tell when revisions have been made in a written essay. Revising makes for a better quality piece of writing, but what may be more important is how evidence of revision speaks to the quality of the writer’s character: taking pride in what they produce and having conviction about the importance of their story. Even more significant is how evidence of revision lets the reader know that the writer truly values the opportunity that is in front of them and has worked hard to make a meaningful connection. 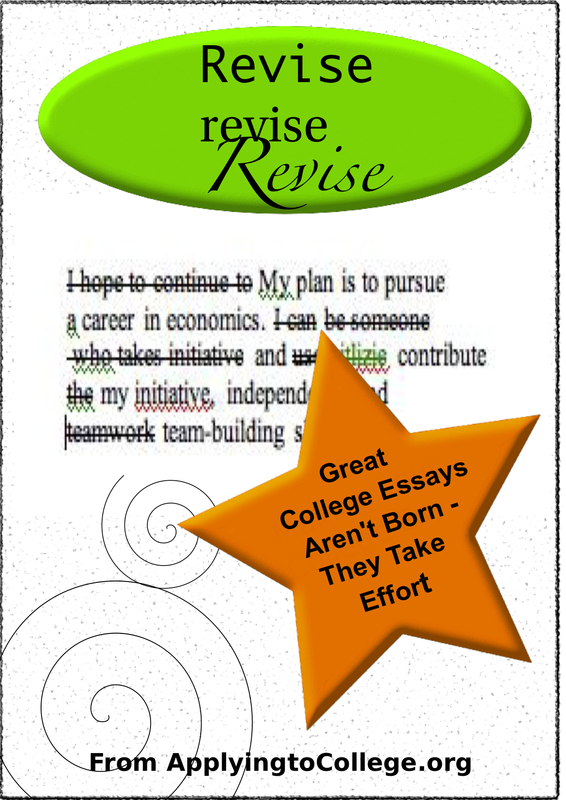 If you really want the opportunity, then do the work of revising the essay. Remember what my students say: Thank you for pushing me. – Debra Wilburn has assisted her own and other students applying to and fulfilling internships, co-ops, study abroad, and career positions in New York; Washington, D.C; Boston; Los Angeles; San Diego; Miami; Atlanta; Cork, Ireland; London, England; Paris, France; Sydney, Australia; Greece, and other destinations. Prior to working at public institution Wright State, Debra was a faculty member in the co-op department at Antioch College, a private, liberal arts college in Yellow Springs, Ohio. Since 1998, she has been a campus liaison to the Disney College Program and The Washington Center for Internships and Academic Seminars. She is the parent of a National Merit Finalist and founder of FilmDayton. Debra earned her B.A. from Cornell University, and her M.A. from Wright State University. Categories: College Essay - Writing | Tags: college essay writing tips, debra wilburn, Disney College Program, revising the college essay, Washington Center for Internships and Academic Seminars, wright state university, writing college application essays | Permalink. How are those college application essays coming? For many students, not well. For many parents, not fast enough. It can be hell out there. The Common Application requires two essays: A “personal statement” of 250 – 500 words, and a shorter essay about an activity or interest (1000 characters, including spaces). If you’re applying to a school that requires supplemental essays, make a list. Write down the exact prompt of each supplemental essay, and the word limit. Some schools don’t accept the Common Application: Write down the exact prompt of each essay, and the word limit. Don’t give yourself more work than you need to. Look at all the essay prompts and decide if it’s possible to use an essay you’ve already written, or an idea from that essay, for more than one school. For example: For the Common App, one of my students wrote about a life lesson he learned while playing ping-pong with his dad. But another school, which didn’t accept the Common App, asked him to write about an activity he enjoyed. So he adjusted part of his Common App essay, and wrote about playing ping-pong with his dad as his activity essay for that school. Trick your brain: Think about your essay everywhere EXCEPT in front of your keyboard. This works, because it allows your brain to become more creative and relaxed. Walk your dog, ride your skateboard, take a shower – let your brain be inspired. Freewrite: Are you having trouble knowing where to start? Then don’t! Forget about writing “THE ESSAY.” Instead, try a freewrite. Give yourself 10 or 15 minutes, and write a train of thought paragraph about your topic. Make sure to include the details: who, what, when, where and why. Then move on to sensory details: What you felt, heard, tasted, saw, smelled. What were your emotions? What were you thinking? How did it affect you? You’ll be surprised at the material you come up with. Then, you should be able to move on to writing your essay. Write Like you Talk. Is your writing too stilted or formal? Talk it out. (Better yet, talk to someone– even if it’s your dog or cat.) As you talk, your sentences will start to flow. Tip #1: Don’t feel like you have to speak in finished sentences. Start by talking about what you want to write about, and why. Tip #2: When you say something you like, write it down. Better yet, record it, and then go back and write down the parts you liked. It’s okay not to have a unique topic, because YOU are what’s unique in the essay. It means, be honest and specific, and write about what’s important about you – what kind of decision-maker, or leader, or artist you are – what’s inspired you, or how you dealt with a problem, or how your life has shaped you. As long as it’s from your point of view, and says good things about you. Write your essay from your perspective, and don’t sweat about finding a unique topic. 5. Escape the Family War Zone. If You’re Overwhelmed, Ask for Help. Never be embarrassed to ask for help. Guidance counselors, teachers and private professionals can answer questions, guide you through the application process, provide feedback on your essays, and work with you on achieving your deadlines. Help is out there – you just have to ask for it. Despite a family’s best support, sometimes a student’s stress level can build to overload. If you’re concerned about meltdowns, missed deadlines, and becoming the “application police,” consider enlisting a professional to help with college search, essay writing skills, application filing, etc. The peace and ultimate success will be worth it. 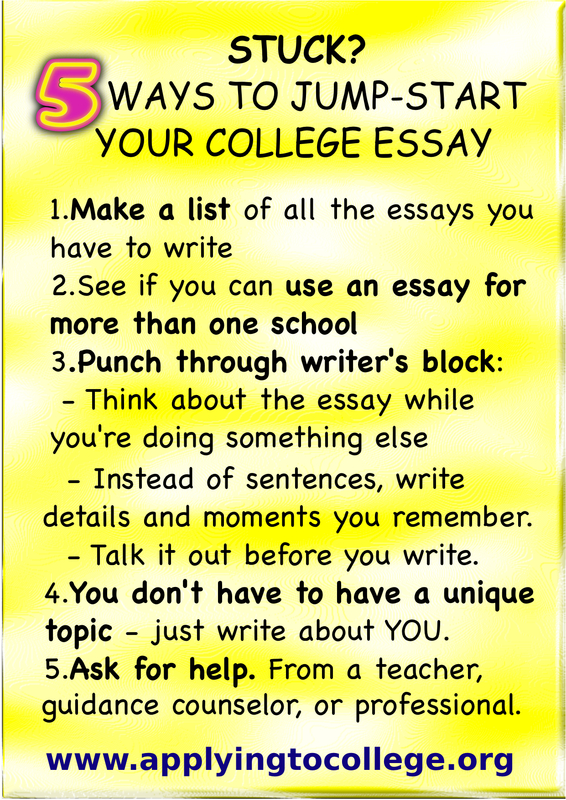 Categories: College Essay - Planning, College Essay - Writing, How to Avoid Essay Stress | Tags: remove writer's block, tips for parents to reduce college applicaiton stress, tips for students to reduce college application stress, tips to reduce college essay stress, writing college application essays | Permalink.